Anyone searching through Google’s main page yesterday would have seen the lovely acknowledgement of the 142nd anniversary of Maria Montessori’s birth in the form of the Google Doodle. 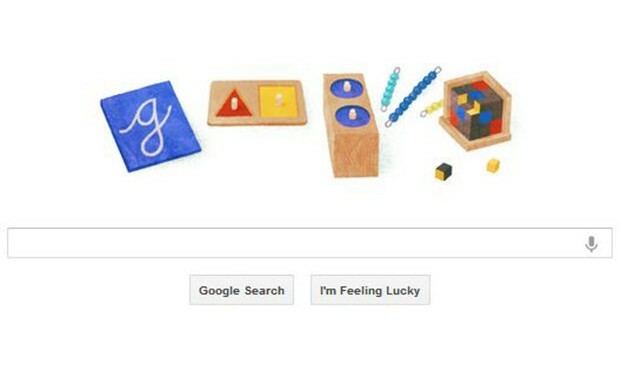 Google founders, Sergey Brin and Larry Page, were both educated in Montessori schools (Brin attended a Montessori elementary program) and they have both been vocal in their praise of Montessori education and the effect that it continues to have on their adult lives. In 2004, ABC’s Barbara Walters asked Larry Page and Sergey Brin about the secret to their success. Both Mr. Page and Mr. Brin had college professors for parents. She wondered if that familial connection to learning played into their success. They said no. Their parents helped, but really their Montessori education was the key. Brin and Page specifically pointed to the curriculum of self-directed learning – where students follow their interests and decide for themselves what they want to learn. “I think it was part of that training of not following rules and orders, and being self motivated, questioning what’s going on in the world and doing things a little bit differently,” says Page, who’s now CEO of Google. Parents may also be interested in this recent Globe and Mail article. In it, a number of executives describe their success and the joy they find in their work as an outgrowth of their Montessori years.